So in August 2016, I announced that my backpacking journey had finally come to an end, at least for now. I had been on the road for too long, 9 years since this travel blog started and I travelled full time for about 7 of the last 13 years, statistics don’t lie, I really backpacked for that long, something like 135 countries/disputed regions and over 800 towns and cities. On the way, I toyed with living in Hong Kong, Bournemouth, Bishkek and even Parramatta. But I just didn’t find a place to settle or stop. 2015 was a topsy turvy year for me. I split up with my girlfriend Panny after 5 years, I tried to find a home in Bishkek, Kyrgyzstan. I finally gave up my jinx and visited India in 2016. Then a few more disputed countries and regions followed. I toured Karakalpakstan, Gorno Badakhshan, Afghanistan and the Kingdom of Lovely before arriving in France to watch Northern Ireland at the Euros. 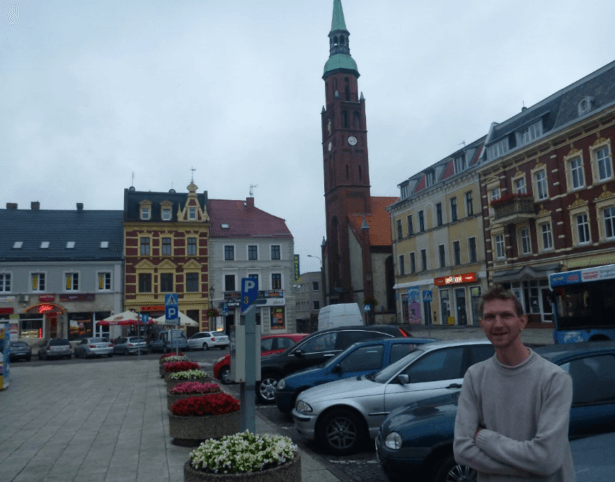 Backpacking in Poland: Gdańsk, oh I’ll stay here! In July 2016, I came here to Gdańsk, Poland to meet my friend Ola and get a visa for Kaliningrad, and then to move back to Bishkek on 13th July. That was the plan. Whoops! Bishkek never happened. The visa was delayed (I eventually got it in August), my friend Ola moved to Poznań in July, and I stayed in Gdańsk as I loved it so much! 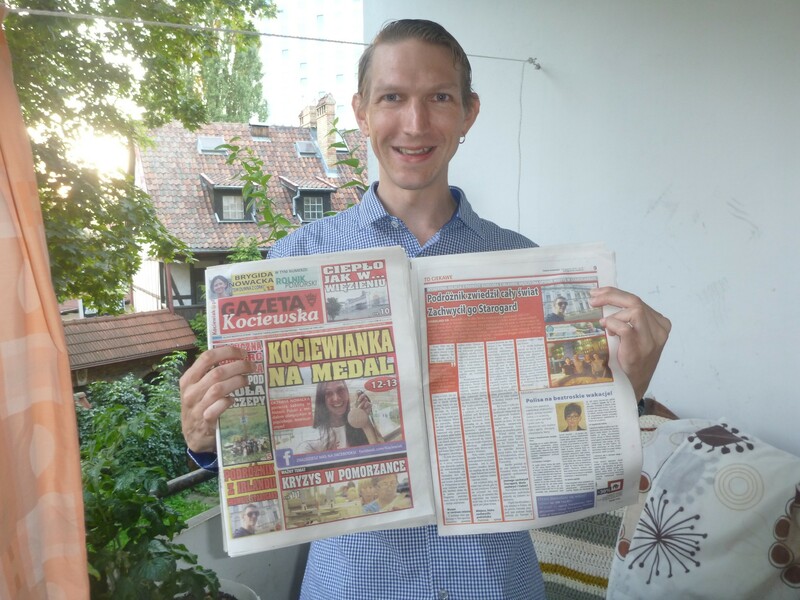 I started to learn Polish and took side trips to lots of towns, one of these side trips was hugely memorable, later made special by this newspaper feature. By late July, as I began to tire of this lifestyle, but there were cool off the ball performances towards the tail end. I visited the place where World War II began, I visited Holy Pelplin and toured Tczew, where actually World War 2 really began. And so in July, I ended up in the unknown town of Starogard Gdański, I enjoyed sampling the culture and ways of this unusual town. Don’t forget – my “normal travels” took me to places you’ve NEVER heard of like: – Nukus , – Balkh, – Adammia, – Ladonia, – Podjistan so somehow, Starogard Gdański was exactly what I needed before hanging up my backpack. The First Backpacking Travel Writer Tourist in Starogard Gdanski! So, after my trip to Starogard Gdański, I ended up somehow on the front page of the regional newspaper for a week – the Gazeta Kociewska. Inside I had a full page feature on my trip to the town, on page 9. Probably the craziest aspect for me was that I was on the front page next to an Olympic Medal Winner, the lovely Oktawia Nowacka! This meant more to me than my The Sun, the Belfast Telegraph or the BBC features! I had made front page of a local newspaper in a cool town, off the wall and twinned with Limerick! 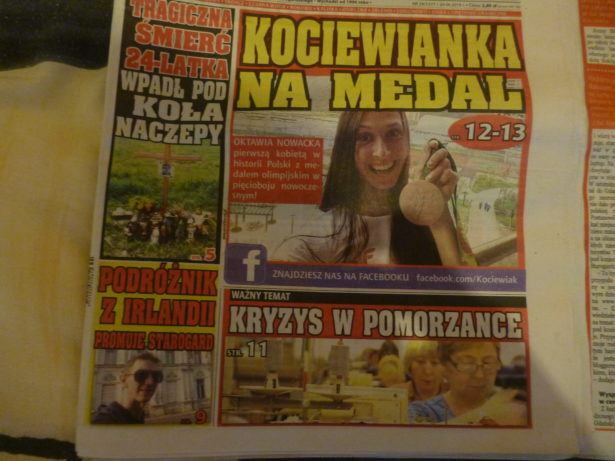 Front Page in the Gazeta Kociewska in Starogard Gdanski, POLAND! So as selfish as it sounds, I wanted to share this article with you all in English on my blog. 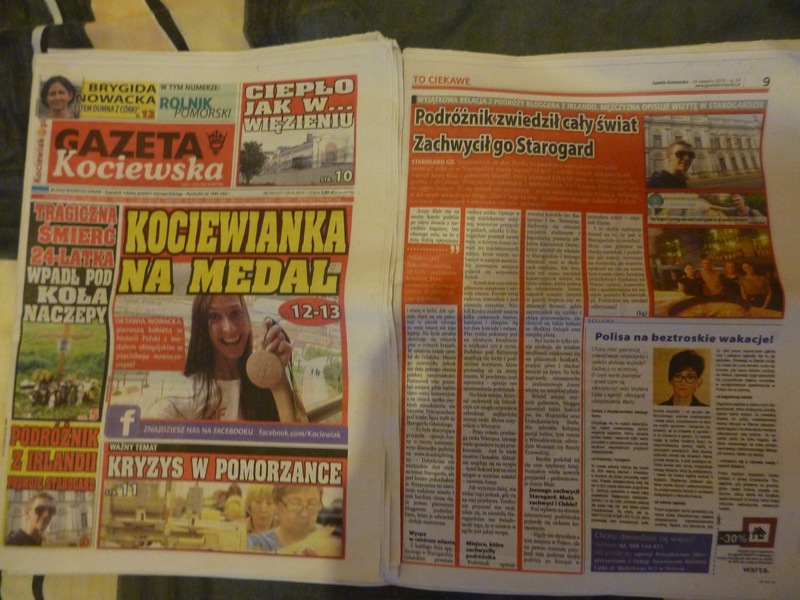 For the Polish version, the online version is here and the full version was available in the physical newspaper. Here is a rough translation into English, I have done my best. Did you know that the Market Square is a square with dimensions of 107×107 meters? Or that we have an island in Starogard? Jonny Blair from Northern Ireland, wrote about these and several other curiosities. Jonny left his town a few years ago on an endless journey with a backpack. During this time, he visited 7 continents, 117 countries, 836 towns and villages around the world. It is, however, not enough for him – ever visited new places, describing them on his virtual blog “Do not Stop Living”. Blogger recently visited the capital Kociewie – Starogard. And it extremely impressed! . Jonny Blair has backpacked around the world with little luggage, without his own car, but with plenty of optimism and faith in people. As he describes, trying not to pack in his backpack anything that weighs more than his laptop. He spent much of his travel life grabbing different jobs in different countries. Recently he arrived to Gdansk. The city enchanted him, but could not complete his image of Polish reality or culture. So he decided to find a place where it will be somewhat less commercial, more off the wall and on the streets he could meet ordinary residents, not just tourists. So because of this, at the end of July, Jonny came to Starogard. – “It was an exciting adventure”, Jonny describes in his online journal travel http://dontstopliving.net, “Beforehand, I did not know too much about Starogard, but in the end I loved it. It reminds me a little of my home town (Bangor in Northern Ireland), and the more I am glad that I am the first travel blogger who visited and wrote about this town” – adds the man. With each day spent in Starogard Gdanski Jonny established separate notes. He describes the most interesting places, evening adventures in pubs, attractions, peculiarities. About Starogard Jonny even wrote a detailed article, in which he concluded the 20 most interesting places to be seen in our city. First appeared the market square, the Rynek, of course. – The market is of course the main place and the heart of the city. There is here a joyful atmosphere and a few tourists. Around the market you can find some interesting bars, cafes and shops. There are also two churches and the town hall. Market Square is located on a perfect square of size 107 x 107m. Apparently the town hall has dungeons and underground passages that lead up to the city walls. In the air, feel the mystery – describes this observative traveller. In the list of places that impressed the Irishman could not miss, of course, the most famous river. Speech, of course Wierzyca. – A river runs through the town – Wierzyca. There are many ways for it to be exceeded. There are many bridges and canals. Currently I am sleeping on the island – the hotel here is on a mini island in the city center! – Jonny notes. As explained further, you can not see this island, however, a hotel and football ground reside on it. It is hard not to admit he was right, it seems that few Starogardzians are aware that in their city, there is an island. – The traveller also describes St. Matthews and St. Katherine’s Church. – Marvel at The Rowniezmiejskim stadium and legendary figure footballer Kazimierz Deyna , who was born in Starogard and whose presence and popularity is felt in and around the stadium. – There are also some more commercial places that Jonny recommends to visit. 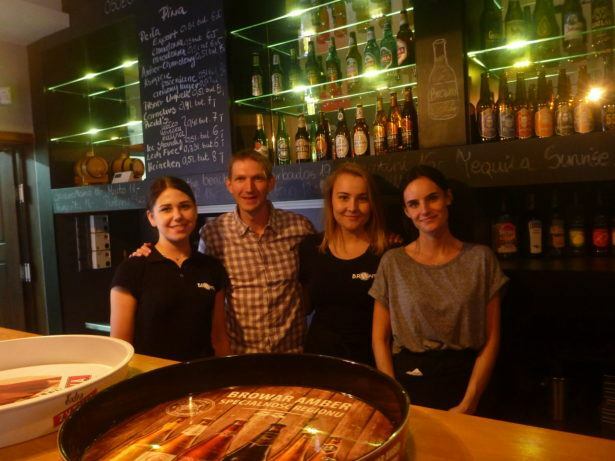 Jonny has established himself among others in the Galeria Neptun or the Restauracja Browar, where he became friends quickly with a team of employees. He was also impressed by the ice cream from Sweet’s Hollow in the town. – Maybe it’s just a summer attraction, but Jonny had the opportunity to relax in the sun loungers on the beach, drink beer and listen to live music in the Rynek. It was really amazing. – Jonny concludes “a visit to the city beach”. – The famous commanding knowledgeable blogger also noted about his visit to St. Wojciech’s Church and the Klubokawiarnia Szafa (Wardrobe Cafe). – Do not run out of another portion of ice cream , this time at the ice cream shop Wrzoskiewicz, and visit the Museum Towers of Tczew. – “I really enjoyed my time here . I have made many new friends” – concludes Jonny Blair. Jonny was impressed by Starogard . And you can be happy. His entry on the website had many interesting comments from readers. – I never heard of this place in Poland, but I would definitely consider arriving there during my trip to Europe next year ! – Wrote Elaine. – and is perhaps Jonny has proved that there is worth here in Starogard. Maybe it’s time for locals to stop complaining for a moment, and like Jonny, go on a trip around the city, to look at it again, this time a bit more favorably ? – We look forward to Your opinions , comments and observations on our portal Kociewiak.pl . Please share your findings! For more information, read the 24th August 2016 edition of Gazeta Kociewska! Here are all my published articles as a travel writer on Starogard Gdański, I think I cornered the niche and I know I deserved this. Following my feature in the newspaper and the huge response on my Facebook Page, I have decided to visit Starogard Gdański again, for one last time. 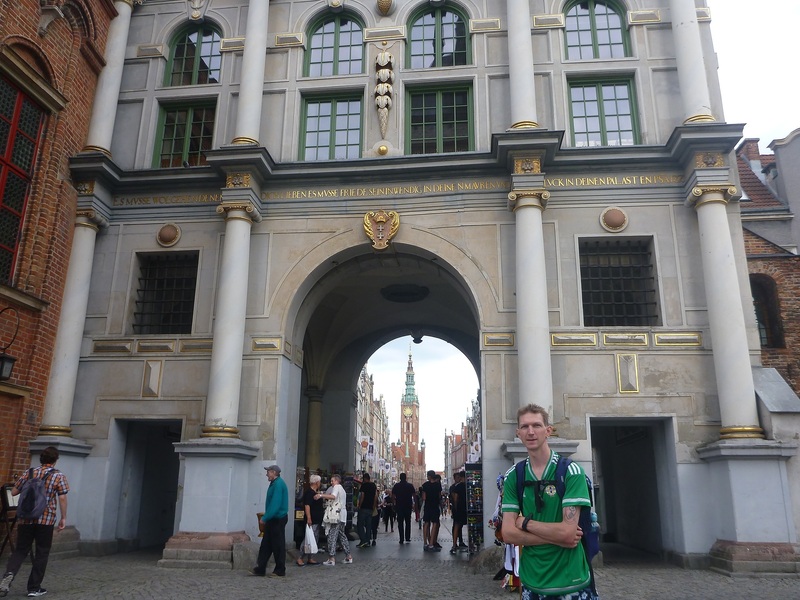 I missed out on some sights the first time – especially the Brewery – Browar Kociewski, the Kazimerz Deyna mural, Cafe Anka and the famous prison (Areszt Śledczy w Starogardzie Gdańskim). I thank my readers from Starogard for these extra tips, and my friend Ola for her tips on her town – I will be back to visit and see the sights she recommended to me. If you are keen to meet up with me on my return, just follow and like me on Facebook or email me(jonny@dontstopliving.net)and look out for my revisit. One day I will also release the poem I wrote in the town, in a poetry book from my 120 country journey. Thank you and Dziękuję bardzo to everyone I met in this town, and those who enjoyed my stories on Starogard Gdański. Without my visits to places like this, my travels would never fulfill my dreams. Watch this video on Starogard, it is amazing!! Wiedzieliście, że plac Rynku to kwadrat o wymiarach 107×107 metrów? Albo że w Starogardzie mamy wyspę? O tych i o kilku innych ciekawostkach napisał Jonny Blair z północnej Irlandii, który wyruszył kilka lat temu w niekończącą się podróż z plecakiem. Podczas niej odwiedził 7 kontynentów, 117 krajów, 836 miast i wsi na całym świecie. To mu jednak nie wystarcza – wciąż odwiedza nowe miejsca, opisując je na swym wirtualnym blogu „Don’t Stop Living”. Niedawno blogger odwiedził stolicę Kociewia – Starogard. I niezwykle się nim zachwycił! . Jonny Blair ma na swoim koncie podróże po całym świecie z niewielkim bagażem, bez własnego auta, za to z dużą ilością optymizmu i wiarą w ludzi. Jak opisuje, stara się nie pakować w plecak niczego co waży więcej niż jego laptop. Na życie zarabia chwytając się różnych prac w różnych krajach. W ostatnim czasie zawitał do Gdańska. Miasto go zauroczyło, jednak nie dało pełnego obrazu polskiej rzeczywistości. Postanowił więc poszukać miejsca, gdzie będzie nieco mniej komercyjnie a na ulicach spotka zwykłych mieszkańców, nie turystów. Tym sposobem pod koniec lipca trafił do Starogardu Gdańskiego. – To była ekscytująca przygoda – opisuje Jonny w swym internetowym dzienniku podróży na www.dontstopliving.net. – Dotychczas nie wiedziałem zbyt wiele na temat Starogardu, ale pod koniec pokochałem je. Przypomina mi nieco moje rodzinne miasto i tym bardziej cieszę się, że jestem pierwszym bloggerem podróżnikiem, który je odwiedził – dodaje mężczyzna. Z każdego dnia spędzonego w Starogardzie Gdańskim powstała osobna notka. Opisuje w niej najciekawsze miejsca, wieczorne przygody w pubach, zabytki. O Starogardzie powstał nawet wpis, w którym Jonny zawarł 20 najciekawszych miejsc, które należy zobaczyć w naszym mieście. Na pierwszym miejscu pojawił się oczywiście Rynek. – Rynek jest oczywiście głównym miejscem i sercem miasta. Panuje tutaj radosna atmosfera i jest niewielu turystów. Wokół Rynku znaleźć można kilka ciekawych barów, kawiarni i sklepów. Są też dwa kościoły i ratusz. Plac rynku położony jest na idealnym kwadracie o wielkości 107 x 107m. Podobno pod Ratuszem znajdują się lochy i podziemne korytarze, które prowadzą aż za mury miasta. W powietrzu czuć tajemnicę – opisuje swe spostrzeżenia podróżnik. Na liście miejsc, którymi zachwycił się Irlandczyk nie mogło oczywiście zabraknąć najbardziej znanej rzeki. Mowa oczywiście o Wierzycy. – Przez miasto przebiega rzeka Wierzyca. Istnieje wiele sposobów na jej przekroczenie . Jest tu wiele mostów i kanałów. Aktualnie znajduję się na wyspie – hotel Rekord jest na mini wyspie w centrum miasta! – zauważa Jonny. Jak wyjaśnia dalej, nie widać tego jednak, gdy się na niej przebywa. Trudno nie przyznać mu racji, zdaje się, że niewielu Starogardzian ma świadomość tego, że w mieście w ogóle jest jakaś wyspa. Więcej na ten temat przeczytacie w bieżącym wydaniu Gazety Kociewskiej! This entry was posted in Daily Features, Europe, Poland, Starogard Gdański. Bookmark the permalink. Good job Jonny. In all you travel itinerary, you deserve the worth of being on the front page of that regional newspaper. Everything is worth it. PS – Of course we can meet in Cafe Anka. It’s a forgiving world if we believe in God. But you need to realise your mistakes. Please. Poproszę Oli.